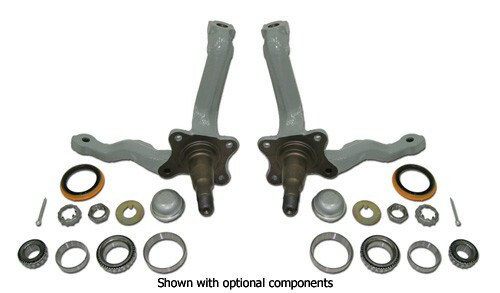 This spindle kit is a major upgrade to the weak 65-69 Mustang and similar Ford spindles. Think about it. The original cars were designed for bias ply tires that didn't grip very well. Now, we are using modern radial tires with lots more grip. 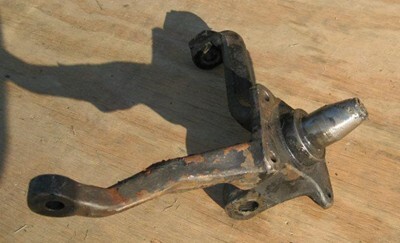 The early spindles are prone to breaking under harsh driving conditions with sticky tires. If you are serious about road racing, open tracking, building a corner carving street machine or lifting the front wheels drag racing, you should upgrade your early spindles. 1 Pair of heavy duty spindles. Machine gray powder coated for long lasting corrosion protection. Set of big inner and outer Timken bearings and races. Spindle nut kit - keyed washers, nuts, nut retainers, cotter pins and dust caps. Dust caps - replace those smashed in ones! 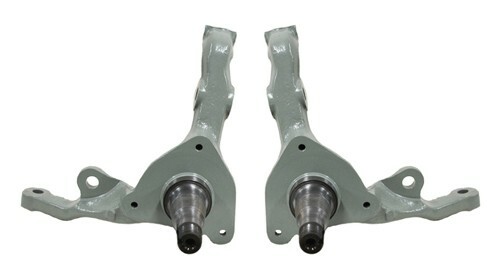 Note: Factory power steering 65-66 cars will require 1 x ST-TR.3 & 1 x ST-ES445RL outer tie rods. Factory manual steer 65-66 cars and 67-73 factory manual or power will require 2 x ST-ES445RL outer tie rods. Please look in the 'Related Items' section below to add these to your shopping cart. If you are purchasing these spindles with one of our brake system you do not need the bearings/seals etc. shown above as these will be included (unless you want spares). Think about this for a second. We are building cars with very capable suspensions using modern, sticky radial tires on 50+ year old spindles. I doubt the Ford engineers could ever dream of the loads we would be putting through spindles designed for skinny bias ply tires. This is not the knob on your radio were talking about. If this part fails its going to ruin your day.